Located along the Atlantic Flyway, Central Park welcomes more than 270 bird species each year. Many birds live in the Park year-round, with others making an important stop in the Park to rest and feed during spring and fall migrations. Just in time for autumn, discover how to spot and appreciate the many birds of Central Park. While Central Park is home to many year-round birds such as the northern cardinal, there are also several other species, such as the gray catbird and barn swallow, to look for during migration seasons. Billions of birds travel thousands of miles each spring and fall along different flyways — in other words, routes. Birds don’t necessarily migrate because of temperature. However, when it gets cold, a lot of their food sources disappear. Insects die or hibernate, and trees stop producing leaves and berries. Migration is essentially a global search for food. Central Park is a popular stopover for birds because of its diverse habitats. The Park’s trees and shrubs provide safe places to nest and offer food in the form of seeds and berries. Birds can also take advantage of the Park’s vast insect life. The Park’s water bodies, many of them adjacent to the woodlands, are welcome homes for aquatic birds. Migrating bird species you may spot in Central Park this season include the blue-headed vireo, song sparrow, eastern kingbird, scarlet tanager, eastern wood pewee, and house wren, among others. 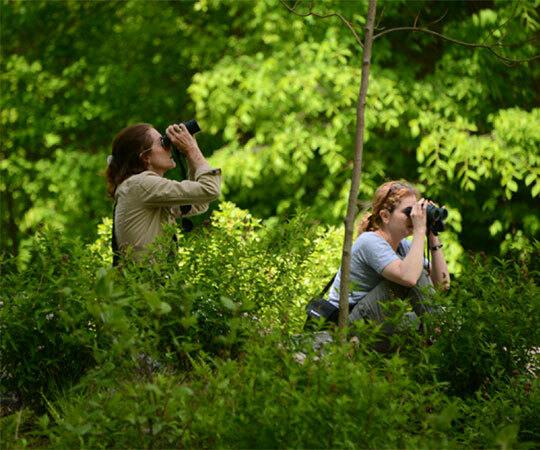 Birdwatchers have already spotted several species of warblers in the Park in recent weeks. Wondering where to go on your birdwatching journey? The Park’s three woodlands are must-visit spots. Let’s start with the Hallett Nature Sanctuary, the smallest and southern-most of the Park’s woodlands. 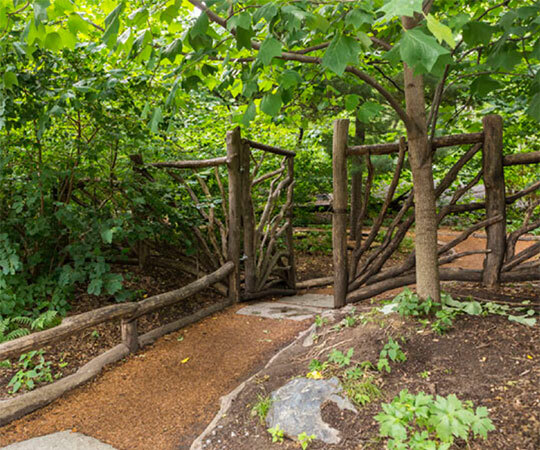 The Hallett Nature Sanctuary, one of the Park’s must-visit landscapes for birdwatching, lies just beyond this hand-crafted rustic gate in the south end of the Park at 62nd Street. The Hallett has a unique history in the Park — it was closed to the public and preserved as a bird sanctuary by NYC Parks Commissioner Robert Moses in 1934. The sanctuary remained untouched until 2001, when the Conservancy began restoration and maintenance work here. It wasn’t until last year that the Hallett began daily open hours for the public. Wander north of Bethesda Terrace to find the Ramble, arguably the center of birding activity in the Park. It features a leafy canopy that helps wildlife thrive, and even features a fun spot with several bird feeders where many birdwatchers gather. The Ramble is also full of benches, making it an easy place to relax amid all the exploring. The North Woods offers the most ground to cover for birdwatching: 40 acres. It features a variety of habitats, from tumbling waterfalls to picturesque pools to dense collections of trees. This area also features the only remaining military fortification from the War of 1812, so birdwatching here can double as a history lesson. Water bodies are also great places to watch for birds. Great egrets, on the hunt for fish and amphibians, are often spotted at the Pond and the Harlem Meer. And of the many species you’ll find year-round in the Park, one of the most spectacular is the red-tailed hawk, which is known to nest along Fifth Avenue. 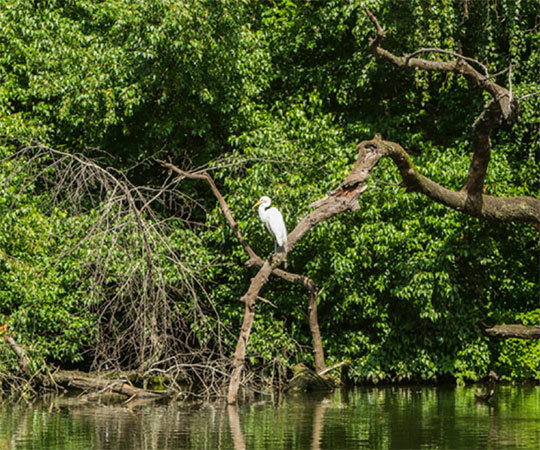 Be sure to visit Central Park’s water bodies — such as the Pond, the Reservoir, the Pool, and the Harlem Meer — to spot birds such as the great egret. Binoculars are great for getting a closer look while birdwatching, but don’t depend on them too much or you may miss what’s right in front of you. Ready to identify a bird? Bring a guide or download an app to your phone, such as this one from the National Audubon Society. Make note of its shape, bill, and markings — but that’s not all. Birds can also be distinguished based on where they’re seen (on the ground or at the top of a tree) and what they’re doing (feeding, pecking, or flying). If you need some gear to enjoy a Central Park birding adventure, don’t worry! You can borrow a free and kid-friendly Discovery Kit year-round from any visitor center. Each kit contains binoculars, field guides, a hand lens, colored pencils, and sketch paper. Want to know more? Join us on a guided tour of the North Woods or the Ramble, and get to know the ins and outs of these fascinating woodlands. The Audubon Society also offers its own excellent tips for birding in Central Park.